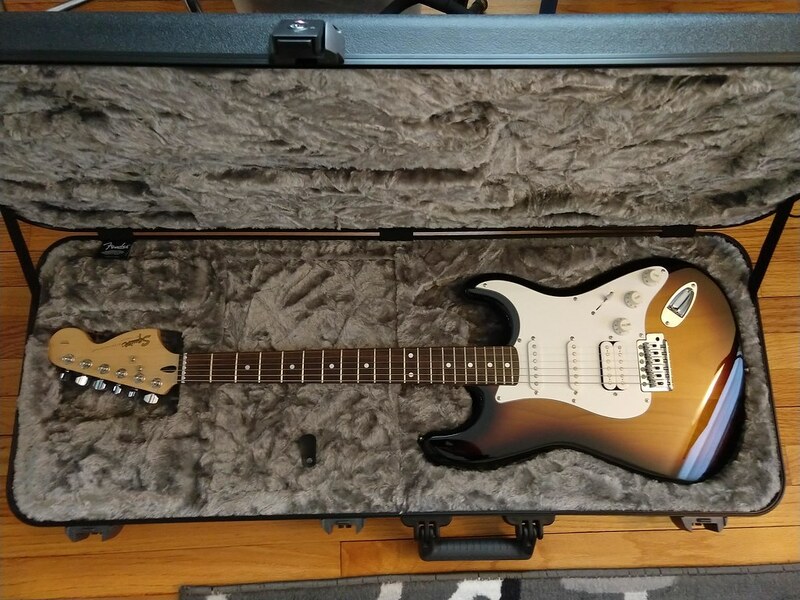 Rediscovered my CY99 Standard Strat...would love to learn more about it! Discussion in 'Squier Stratocasters' started by kniah, Jan 31, 2019. But, I've recently gotten a second wind - 18 years later! A couple co-workers of mine decided to form a rock band and were too polite to say no to a beginner. I've been jamming the past few months a couple times a week and am having way too much fun. I recently read up on how to do a basic setup and finally replaced the 18 year old strings. 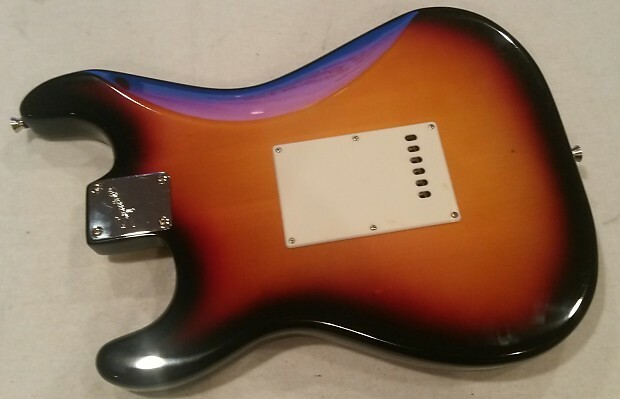 Still in love with the sunburst finish as much as the day I bought it. It's completely stock except for the roller nut, which I installed after the plastic nut broke back in high school (I think it was an ebay special). 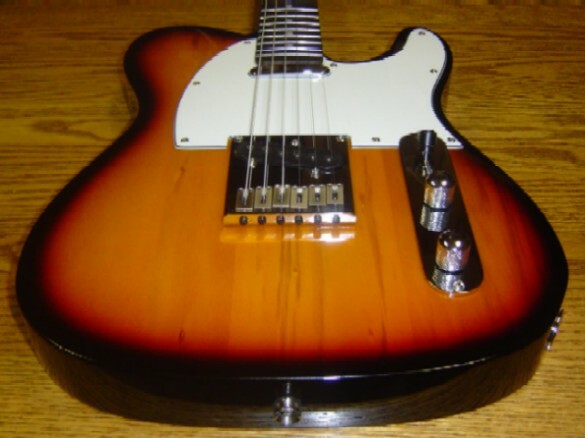 While researching I stumbled across this site and would be grateful for any information that folks can provide on this guitar. Seems like it is a Yako (Taiwan?) made instrument. It's got 21 frets, a thinner neck (I roughly measured 41mm with a tape measure at the nut), and full size 1.75in thick body. Also has the 6-point trem. 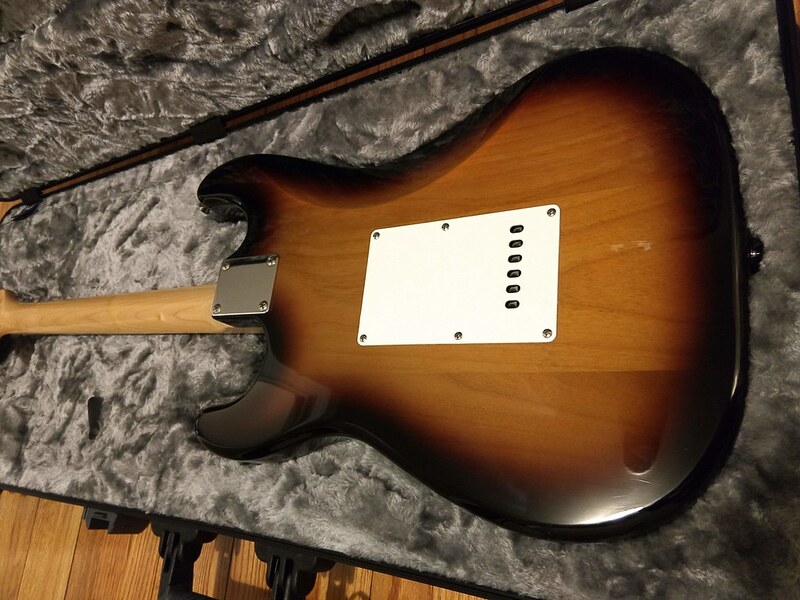 I'm curious if anyone has any thoughts on the pickups, body wood type, and any recommendations on worthwhile upgrades. Thanks in advance! Grey Melbourne, squierbilly, BlueSquirrel and 5 others like this. well, it certainly says "standard", and it should be 1999? looks like it has a replaced nut perhaps? Welcome to Squier-Talk, @kniah - I am sure someone who knows more will be along soon! SquierTap, Eddie and Kenneth Mountain like this. oh, and she's a beauty! 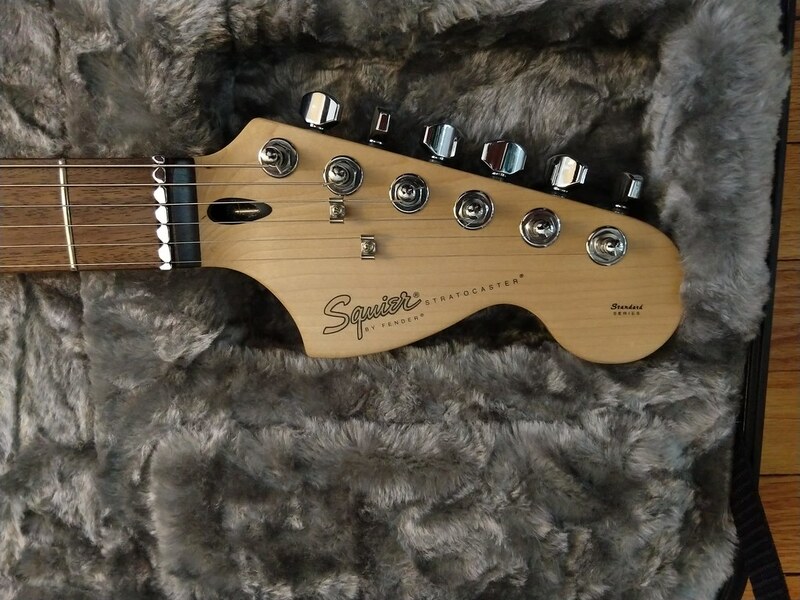 Nice looking Squier, friendo! Play hella outta it!! Rey08, SquierTap, squierbilly and 3 others like this. 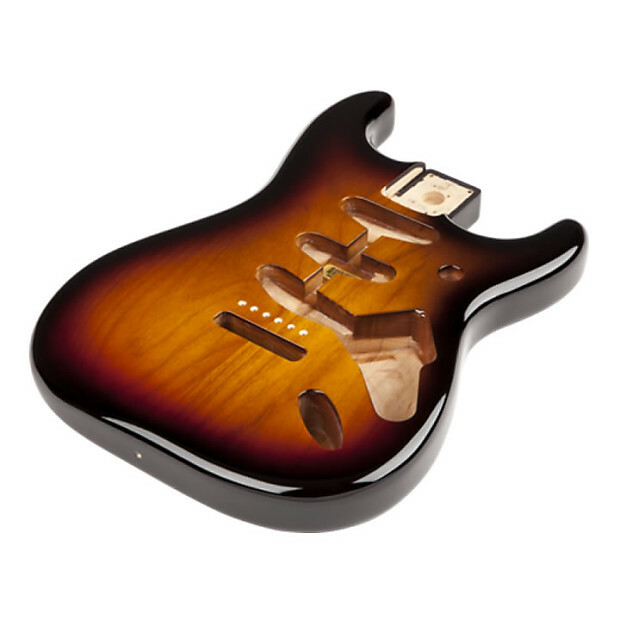 Welcome to Squier Talk - Beautiful strat ! listen to ace - keep her stock until you get a little better ! ! amazing shape for a 20 year old - nice case also ! SquierTap and Eddie like this. Nice guitar! I had a 2000 standard. 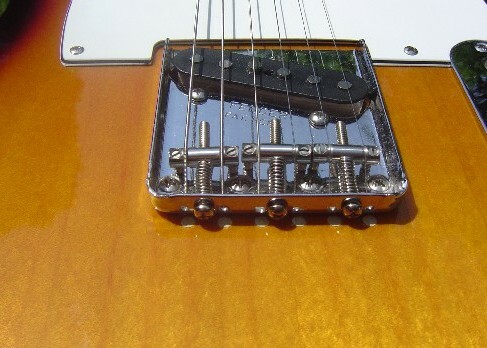 6 screw trem with ceramic pickups. It sounded great. I didn't upgrade the pickups or electronics because it sounded so good. My tuners were even original. I did replaced the nut to bone. I sold it last year when I thinned out. Play it a while and then you'll know if something needs to be upgraded. SquierTap, Kenneth Mountain and Eddie like this. She's purdy.. keep her stock. Beautiful guitar. Welcome to the forum. You'll love it here. The Yako built Standards are fantastic. You have a rare instrument. No need to change pickups ... just enhance them. Man, the amount of tones you'll be able to obtain is unimaginable. SquierTap, squierbilly, BlueSquirrel and 1 other person like this. Thanks for the warm welcome and compliments on the guitar! No worries, only upgrades so far have been a new case (old gig bag seemed inadequate since I'm actually taking it on the road regularly now) and a new strap. The guitar is not the weak link in this relationship! I have really enjoyed getting reacquainted and trying to learn as many different styles of music as possible. Looking forward to being a part of the community here and soaking up all of the info. SquierTap, BlueSquirrel, Eddie and 1 other person like this. Hello, welcome and congratulations.. A CY Standard is a rather uncommon guitar. Some believe, and I subscribe to the theory that Yako built guitars are a cut above their contemporaries. The fit, finish and comfort level is superior. Man, that thing is clean! Lovely guitar there. I agree with all the rest of the “keep it stock” folks. Nice axe! You have a lot of catching up to do with that baby! Leave it stock and rock. SquierTap, Kenneth Mountain, Dave M and 1 other person like this. 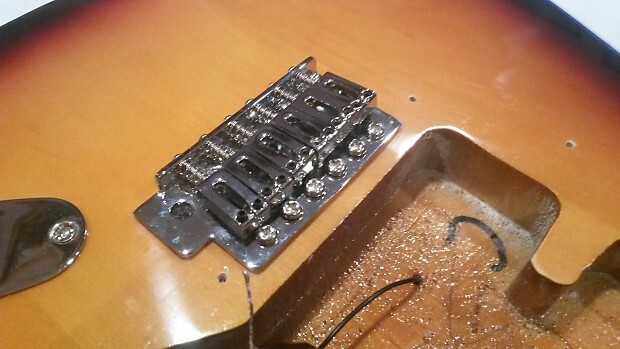 Well for starters it's the first year for the standard, and it's uniqueness is that was only made for 2 years then they went to 22 frets........That baby is way to clean....!!! NICE !! SquierTap, Kenneth Mountain, BlueSquirrel and 1 other person like this. BTW Instruments which come out of the Yako factory have a good reputation! 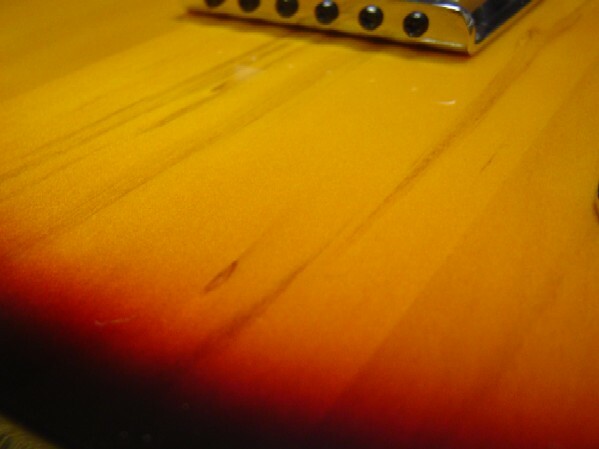 99 Strat Standard Squires are listed as Hardwood with 45mm thickness bodies, 2000 onwards are lsted with 45mm thickness Agathis, 22 frets, etc. Looks like an Alder body. 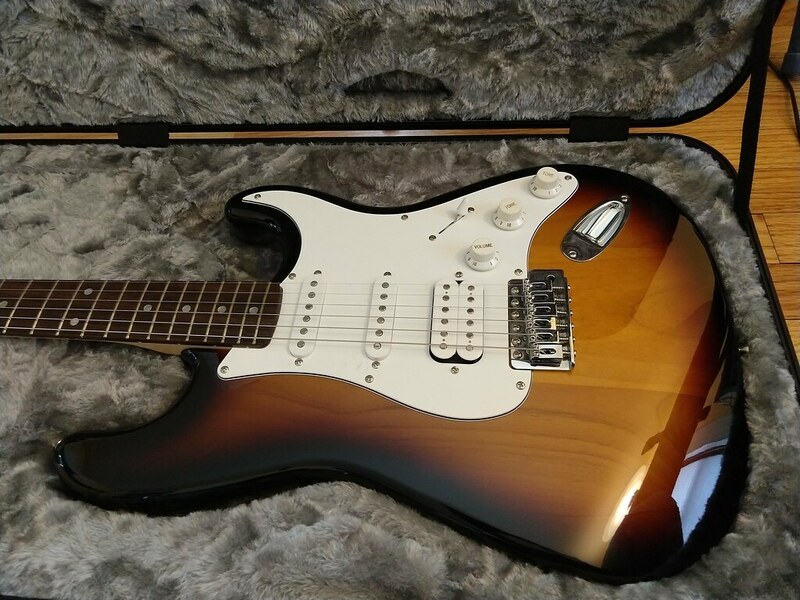 I have a Squire Standad (CY 2000) but upgraded, a really nice player and my main gigging guitar. Kenneth Mountain and squierbilly like this.